« LIVE ON THE WEST SIDE! Introducing PARK STATION Vancouver Oakridge Langara Condos from <$600k! Introducing Bold Properties’ premier collection of 29 advanced homes in Mount Pleasant. Featuring our integrated system of smart home technologies – from wireless climate and lighting control to keyless entry – Synchro is based on the principles of human-centred design. Synchro Mt Pleasant condos are located at 379 East Broadway Vancouver. 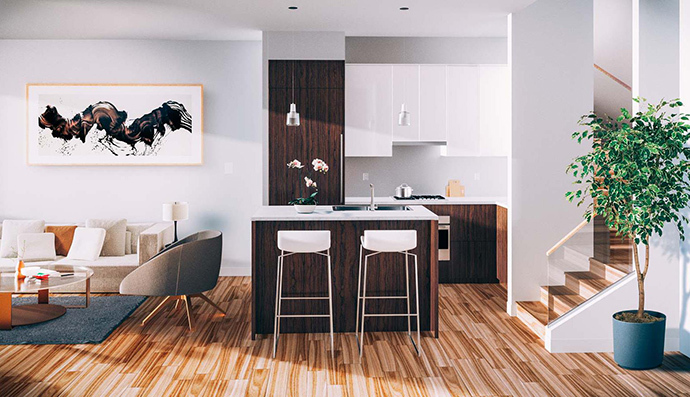 The new Vancouver Mt Pleasant condos are brought to the market by Bold Properties. The project team also consists of Ankenman Marchand Architects, Portico Design Group and Bold Construction. Life in synchronicity today! A unique living experience harmonizing smart home technology and thoughtful interior design in one of Vancouver’s hottest neighbourhoods, the Synchro Mount Pleasant condos for sale are now launching! Meticulous attention to detail on how we live and how our homes can further create the best living experiences is incorporated into each and every home here. The homes are interconnected, responsive and effortless, just the way life should be lived! 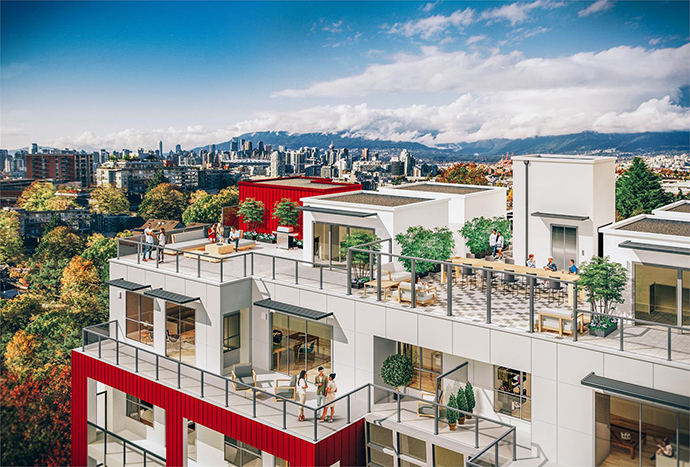 There are only 29 Smart Homes at the new Vancouver Synchro condo project which is based on the principles of human-centric design and innovation. The Synchro Penthouses will have private rooftop decks with sweeping views. There is also a communal rooftop communal dining area and outdoor kitchen. 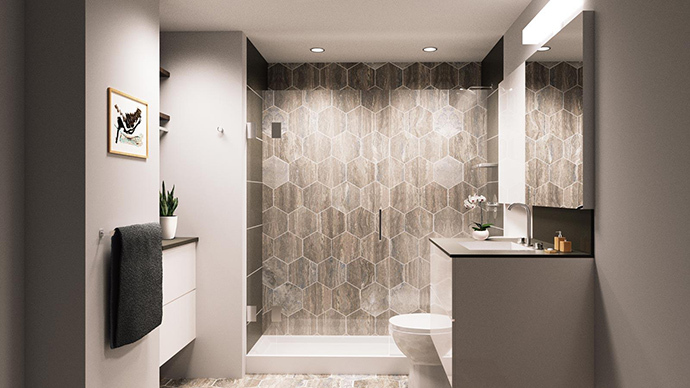 An innovative interior design process based around people was incorporated into the homes at Synchro Vancouver: how you use space and how technology can facilitate an even better experience. Here are some of the spectacular features that you as the homebuyer will love. Energy Efficiency: Smart controls automatically adjust temperature and lighting when you are home and when you are away– increasing energy efficiency. Connectivity: Features synced up with your smartphone, so you’re connected to your new Synchro Vancouver home, wherever you are. Peace of Mind: Forgot to lock the door or turn off the lights? With controls accessible from anywhere, you can rest assured knowing all is well at home. Smart Lighting: Making your home safer and friendlier. Schedule lights to adjust automatically at specific times during the day. Wirelessly control your lights from anywhere in the world using your smartphone! USB Outlets: an easy, clutter free way to charge your USB devices. The adapter free USB charging port has a Smart chip that optimizes the charging requirements of your devices. Hidden Spice and Cutlery Drawer: Intelligently designed presale Vancouver Synchro ocndo homes feature amazing drawers throughout the kitchen with built in organizational units that are perfect for storing spices and utensils. An additional pull out drawer is notched around the drop-in sink. Magic Corner: A compact, flexible, and ergonomic storage solution for blind corners. Four hinged baskets smoothly fold out into the kitchen and are perfect for storing larger cookware for easy access. Keyless Entry: No more fumbling with keys. It’s a touch-to-open convenience smart lock powered by your smartphone and Bluetooth. Send and manage eKey access via your smarthphone too! Wireless Climate Control: A smart WiFi thermostat is included with every home at the new Synchro Vancouver Mt Pleasant condo with remote wireless sensors that customize room temperature measures, saving you money on heating and cooling costs. Apple TV: Every home at the Mt Pleasant Vancouver Synchro condos will come with your own Apple TV hub so that you can control your home’s devices remotely or through your TV. The interior design is carefully selected by Portico design Group with open concept floor plans, expansive 9 foot ceilings and lots of in suite storage. The homes will have laminate floors throughout and custom Solarfective roller shades. The presale Vancouver Synchro Mount Pleasant condos also come with spectacular kitchens that feature Caesarstone quartz counters and backsplashes, full height two toned laminate cabinetry with soft closing mechanisms, great appliance package with Fulgor and Blomberg appliances in addition to a large stainless steel double bowl (2 bed units) or single bowl (1 bed units) under mount sink and under cabinet lighting. All homes at the Mount Pleasant Synchro Vancouver condos will come with 24” Blomberg front loading washer and European vented dryer, recycling/waste bins, ClosetMaid linen shelving with hang bars and built in air conditioning for penthouses (additional cost for other floors). Also, there is a parking stall included with each suite. The beautiful bathrooms at the presale Vancouver Synchro condo residences includes custom vanities with matching backsplashes featuring quartz slab counters, soft closing doors and drawers, elegant under mount sink, modern and polished chrome Grohe faucet and clear silver mirror with bright overhead LED lighting. The bathrooms have luxurious and spacious glass enclosed shower with beautiful honeycomb tile surround, Grohe rain shower head in the master ensuite and the second bathrooms have five foot Hytec rectangular deep soaker tub. 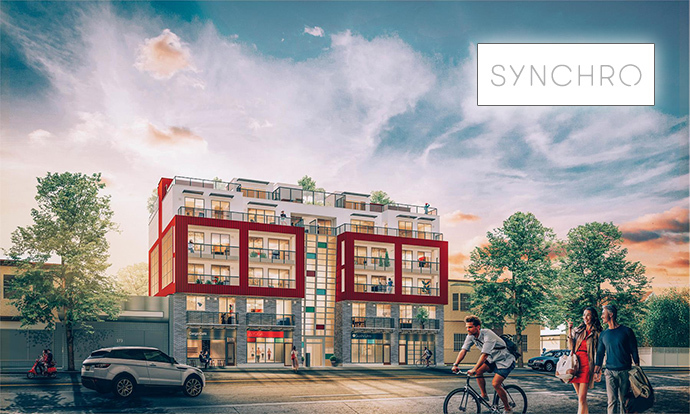 From the Synchro condo marketing web site: Synchro is designed with innovative interior design and storage solutions that enhance quality of life. Proposed SkyTrain Station at Broadway & Main: The proposed Millennium Line Broadway Extension will see a new station at Broadway & Main: just a few steps from Synchro Mount Pleasant, connecting you effortlessly to the Lower Mainland. Home Automation with Keyless Entry: Featuring our integrated system of smart home technologies – from wireless climate and lighting control to keyless entry. Rooftop Amenities at the Mt Pleasant Synchro Vancouver condos: Barbeque amenities, a large communal long table and comfortable lounge furniture make this an ideal space for entertaining guests. A large children’s play mat make this a more convenient alternative to going to one of Mount Pleasant’s many parks. Mountain + Downtown Views: Unique, spectacular views of the downtown core and the North Shore mountains make Synchro’s outdoor rooftop spaces a prime entertainment venue and connect you at a moment’s notice to this picturesque landscape. Multi-functional communal spaces. Integrated smart technology. Panoramic views. Synchro Vancouver condo’s innovative, human-centered design process has been applied both inside and outside your home. We have built Synchro with the contemporary West Coast lifestyle in mind: large communal dining areas for dinners in front of the setting sun, an open-air children’s play area, and an interconnected suite of advanced home technologies. And of course, surrounding it all: expansive views of the Vancouver skyline and the North Shore mountains. A truly elevated living space in this quiet, people-centred neighbourhood.